Our Abpromise guarantee covers the use of ab21448 in the following tested applications. Binds to the patched (PTC) receptor, which functions in association with smoothened (SMO), to activate the transcription of target genes. In the absence of SHH, PTC represses the constitutive signaling activity of SMO. Also regulates another target, the gli oncogene. Intercellular signal essential for a variety of patterning events during development: signal produced by the notochord that induces ventral cell fate in the neural tube and somites, and the polarizing signal for patterning of the anterior-posterior axis of the developing limb bud. Displays both floor plate- and motor neuron-inducing activity. The threshold concentration of N-product required for motor neuron induction is 5-fold lower than that required for floor plate induction. Expressed in fetal intestine, liver, lung, and kidney. Not expressed in adult tissues. Defects in SHH are the cause of microphthalmia isolated with coloboma type 5 (MCOPCB5) [MIM:611638]. Microphthalmia is a clinically heterogeneous disorder of eye formation, ranging from small size of a single eye to complete bilateral absence of ocular tissues. Ocular abnormalities like opacities of the cornea and lens, scaring of the retina and choroid, cataract and other abnormalities like cataract may also be present. Ocular colobomas are a set of malformations resulting from abnormal morphogenesis of the optic cup and stalk, and the fusion of the fetal fissure (optic fissure). Defects in SHH are the cause of holoprosencephaly type 3 (HPE3) [MIM:142945]. Holoprosencephaly (HPE) [MIM:236100] is the most common structural anomaly of the brain, in which the developing forebrain fails to correctly separate into right and left hemispheres. Holoprosencephaly is genetically heterogeneous and associated with several distinct facies and phenotypic variability. The majority of HPE3 cases are apparently sporadic, although clear examples of autosomal dominant inheritance have been described. Interestingly, up to 30% of obligate carriers of HPE3 gene in autosomal dominant pedigrees are clinically unaffected. Defects in SHH are a cause of solitary median maxillary central incisor (SMMCI) [MIM:147250]. SMMCI is a rare dental anomaly characterized by the congenital absence of one maxillary central incisor. Defects in SHH are the cause of triphalangeal thumb-polysyndactyly syndrome (TPTPS) [MIM:174500]. TPTPS is an autosomal dominant syndrome characterized by a wide spectrum of pre- and post-axial abnormalities due to altered SHH expression pattern during limb development. TPTPS mutations have been mapped to the 7q36 locus in the LMBR1 gene which contains in its intron 5 a long-range cis-regulatory element of SHH expression. The C-terminal domain displays an autoproteolysis activity and a cholesterol transferase activity. Both activities result in the cleavage of the full-length protein and covalent attachment of a cholesterol moiety to the C-terminal of the newly generated N-terminal fragment (N-product). The N-product is the active species in both local and long-range signaling, whereas the C-product has no signaling activity. Cholesterylation is required for N-product targeting to lipid rafts and multimerization. N-palmitoylation of Cys-24 by HHAT is required for N-product multimerization and full activity. Cell membrane. The N-product either remains associated with lipid rafts at the cell surface, or forms freely diffusible active multimers with its hydrophobic lipid-modified N- and C-termini buried inside and Secreted > extracellular space. The C-terminal peptide diffuses from the cell. ab19897 detects a 180 AA (22 kDa) recombinant fragment of mouse Sonic Hedgehog (lane 1). 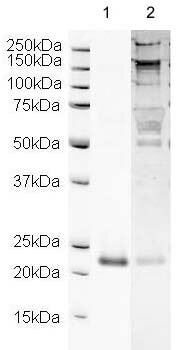 Binding of ab19897 to Sonic Hedgehog was reduced when blocking using the immunising peptide (lane 2). ab21448 has not yet been referenced specifically in any publications. Publishing research using ab21448? Please let us know so that we can cite the reference in this datasheet. I have purchased "Wnt5a peptide (ab95849)" which the concentration is 1mg/ml. However, I need to use the stock concentration at 0.04mg/ml. How can I dilute the solution? Should I just use water? Henry PARK (Hyun Woo PARK), Ph.D.
Hope this is helpful. Please contact me again if you have any further questions.